When you talk about food relocalization with farmers and others who embrace the industrial capitalist logic of maximizing efficiency in farming, you tend to hear one phrase over and over again: "You can't feed the world that way." The immediate snappy answer, of course, is, "We're not trying to feed the world--we're trying to figure out how to feed individual regions, as used to happen before the food supply became so industrialized, commoditized, and globalized." But even if you accept (as I do) that this is a crucial task, the question is still one that should be pondered. Can we go back to feeding the world on a region-by-region basis? More specifically, can we do it here in New England? 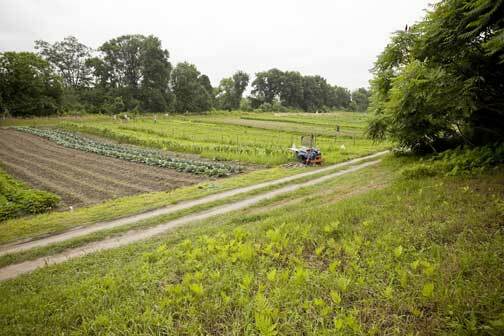 Six or seven million acres of farmland would need to be devoted to food production. This is comparable to what existed in the region just before the watershed moment of World War II, when fossil fuels really became the bedrock of an increasingly industrialized agriculture. Population (currently just over 14 million people) would need to continue to grow fairly slowly, to around 17 million people 50 years from now. Out of this 15 million, there would need to be 50-100,000 people farming, not really that much of an increase from the 30,000 who are doing it now. We would need to eat in healthier ways--more fruits and vegetables, less red meat, more fish, lower calories overall (you know--the way we already know we should be eating!). More concerted efforts would need to be made to protect farmland and to make it affordable and possible for farmers to cultivate it. New England farmers would have to develop modes of pasturing animals without just stripping forest cover and depleting upland soils, as was done during the sheep and dairy booms of the 19th and 20th centuries. They would also have to continue developing smart ways of extending the growing season (for example, via hoop-houses, which are proliferating virally around the New England landscape at present). The region would have to import at least some of its grain. Donahue points out that western farms can produce and ship feed grain, in particular, much more efficiently than our smaller farms, so why not let them do it? 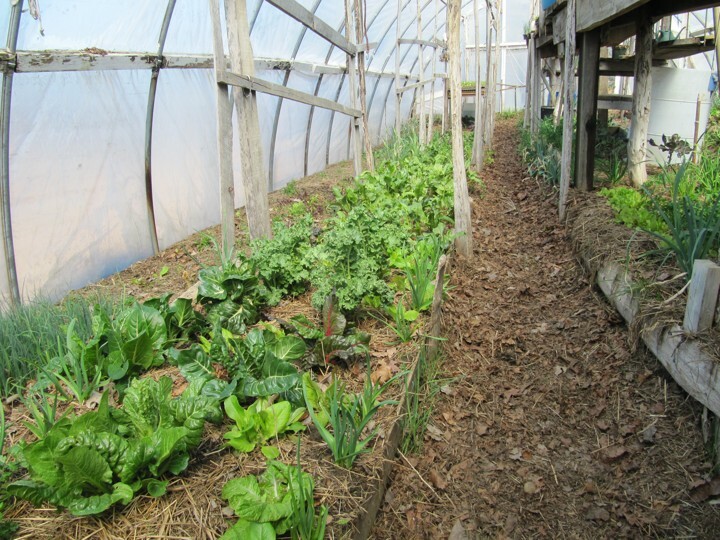 Under these conditions, Donahue and Piotti believe that New England could make itself 80% food self-sufficient in the next half-century (during which they also expect that energy prices will continue to rise, making all of these changes more economically feasible and urgent). This scenario raises many questions, which both speakers acknowledge. What would create the political will to get us there, particularly in terms of protecting and giving farmers access to those additional millions of acres of farmland? How do we get more people to internalize all the "externalities" that go into producing food (land costs, subsidies of various kinds, and so on)? How can we guarantee equitable access to this good healthy food when it's going to continue to be more expensive to produce than the commodified versions we find in supermarkets and big box stores? What I like about these two talks is not just that they're up front about these questions and generally hopeful that we're already on the way toward addressing and answering them. More interesting to me is the really ecumenical and non-ideological vision that both Donahue and Piotti hold for the future of New England farming, and the flexible, thoughtful way they're drawing on history. Donahue's emphasis on thinking regionally rather than just locally echoes the ideas of his fellow historian James McWilliams, who has argued in A Revolution in Eating: How the Quest for Food Shaped America (Columbia University Press, 2007) that even in the colonial era, Americans were always linked in to regional, inter-regional, and global networks of trade. I had good intentions of writing a post week here every week, but inevitably, my schedule has been steam-rollered by the mighty force that is the spring semester. Now that we're into March, though, there's beginning to be a bit of light at the end of the teaching tunnel, and I'm aiming to start posting more frequently again. March also means longer days (and changing the clocks last night) and rising sap, which in this part of the world translates into maple syrup season. Maple syrup has been striking me lately as being exceptionally "good to think with" when it comes to questions about food, farming, heritage, climate, and environment. For one thing, it occupies a possibly unique place between foraging and farming--more interventionist than gathering wild mushrooms in the woods, yet still deeply dependent on wild plants (that is, maple trees) and environmental conditions that are largely beyond producers' power to control or mitigate. 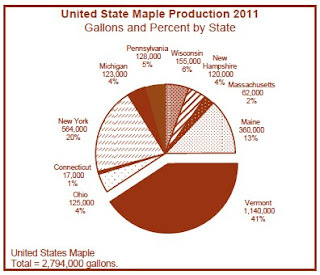 2011 was one of the best syrup seasons in several decades for much of New England, including Franklin County, Massachusetts, where I live. Average temperatures continued to rise as the climate has warmed, but many syrup producers were able to adapt by tapping trees at slightly higher elevations. This year, however, our strange "non-winter"--next to no snow, exceptionally moderate temperatures--apparently bodes very badly for syrup-makers. 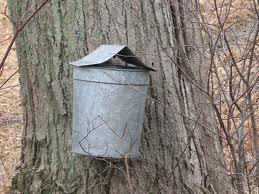 One farmer interviewed for a Boston Globe article this week reported that the sugar content in his trees' sap was only a quarter of what it usually is, meaning that the ratio of raw sap to boiled-down syrup will need to be much higher, possibly making it impossible to turn a profit. Beyond a certain point, sap-gathering forces humans to bow to the weather, and predictions about continued climate change show southern syrup-production in places like Pennsylvania and Connecticut disappearing within the next century, with the gains shifting north to Quebec and elsewhere. Maple syrup also seems poised almost perfectly between "pastness" and and the present-day farm economy. It invokes a time when imported sugars hadn't yet established a monopoly on sweetness in this part of the world. Its association with the coming of spring and with rural landscapes, and the fact that it's one of the few modes of food production that still relies largely on burning wood as fuel, makes it inherently nostalgic for a lot of us. Whenever I taste good maple syrup (and by "good" I mean hefty Grade B, not that light amber stuff), I get a memory hit: Easter visits to my grandparents in rural Ontario, where my grandfather presided in patriarchal splendor over operations at the sugar shack. With help from male relatives and neighbors, he turned out gallons of syrup every spring, which went onto the breakfast tables at the family hotel all summer. I suspect that the sense memories associated with syrup-making--the crackling fire, the smoke and sweet steam from the condensor, the feel underfoot of ground just beginning to soften--works in a similar way for many people. On the other hand, maple syrup is a "real" product that helps keep a lot of small farms in this part of the world economically viable. Particularly in Vermont, which produced 41% of all American maple syrup last year (and where maple syrup accounted for about 15% of overall farm product sales), those sugar shacks are big business. (Here's a PDF with all the 2011 maple syrup statistics your heart could desire.) For all the nostalgia associated with those old galvanized sap buckets hanging from trees at this time of year, producers have been understandably quite unsentimental about switching to plastic tap lines that bring the sap to them rather than requiring a trek through snowy or muddy woods to collect it. And this industry's vulnerability to weather patterns makes it a site where discussions about climate change are especially sharp and salient. This is something that actually gives me hope (aside from the fact that it's just inherently hard not to feel more hopeful at this time of year). Intersections--of past and present, nostalgia and innovation, winter and spring--can be fruitful places for thought and potential change. Most people have so lost touch with the realities of seasonal food gathering and production that maple-syrup season means just a spring jaunt in the car in search of pancakes, but at least that's something. If it helps to maintain places and practices where more serious economic and environmental realities come to seem real and perhaps urgent, that's all to the good.